I am writing you this letter in the morning 'cause I know you don't like reading by candle­light. I hope you and Ma and all the little-uns back in Groundhog Holler are doin' fine and that the crick ain't riz too much with all the rain. Remember when I got that invite to FFFF from cousin Obidiah O'Brien and you said I orta go 'cause 4 F's reminded you of the best I ever did in Grade School? Waal it turned out Obidiah (everyone around here calls him Obie) invited about two hunnert magicians to Batavia, New York at the end of April for the 43rd Fechter's Finger Flicking Frolics (now officially named Obie's 4F). And Pa, you know how just about everyone in Groundhog Holler is our cousin or aunt or uncle or something ... well it turns out these magicians is all cousins of ourn too! I'm gonna use this letter to bring you and Ma up-ter-date on what some of our long-lost relatives is up to. You ain't gonna believe this but they's over 15 thousand people living in Batavia – they got sidewalks and streetlights and everything. My eyes nearly fell out of my head when I saw they even got a shop that serves about a million kinds of coffee – and folks here all knows the difference! But that ain't nothing compared to the magic at FFFF. It all started on Wednesday night around sundown, when cousin Obie blew this loud whistle for everyone to go to the big room for a lecture. I figured we was all in trouble (I 'member getting some pow'ful lectures from Ma) but it weren't nothing like that. 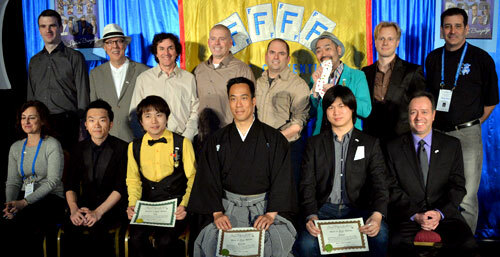 One of our Japanese cousins, Hiro Sakai, stood up and taught us a passel of the cleverest ideas I ever seen. He changed a bunch of cards into different cards all at once, changed a dollar into four quarters, and made a $10 bill look like two $10 bills and then they turned into a $20 bill. He also did a dandy routine with beer bottle caps – cousin Buford would love it. 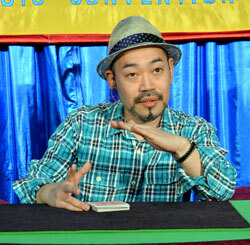 Hiro's lecture kinda set things up for the whole weekend – we knew we was in for some mighty fine magic. And the very next thing that happened was another lecture. This time it was cousin Woody – I think Gran-pappy mentioned him a couple of times – Woody Aragon from Spain. He's a pow'ful smart little feller – he taught us some super card magic – he can spell like Einstein! His spelling tricks are so good I'm real grateful you made me learn pretty much the whole alphabet. A lot of people wanted to get his book, including me. It's darned good, pardon my language. After them lectures I followed a bunch of fellers into a room where they was selling all kinds of magic books and magic DVDs and magic equipment – seems like some of our cousins are real inventative! Then I found this other room where cousin Obie had set out sodee-pop and boxes of donuts – for free! I set around there for a good while, watching folks like our cousins Oscar Munoz and Paul Gertner do magic that'd just about drop your jaw. I'll tell you Pa, folks at FFFF sure don't keep normal hours. Why, most of them was just going to bed around sun-up, when sensible folks is getting up to milk the chickens and shear the pigs. Anyways, the first thing that happened the next morning was another lecture. I ain't never learned so much useful stuff in such a short time (exceptin' that day Uncle Zeb and Aunt Lulu decided to air their differences in public). This next lecture was from another one of our Japanese relations, cousin Akira Fujii. Now there's a guy with a mountain of talent. He can do things with a pack of cards that I still don't believe, even after he taught us how he does them. And he made two cigarettes pass right through each other, right under our noses. He says it works with straws too so maybe we can learn this one back on the farm. We had a little time for lunch but it don't seem like anybody around here knows how to make squirrel pie, so I bought a hamburger – dang me if it didn't taste like squirrel after all. Then it was time for the first show – see Pa, at FFFF everybody is expected to be ready to perform something for the gang so you get to see a wagon-load of people each doin' their best thing. The Master of Ceremonials was cousin Joe "Jehosaphat" Turner. He is one sharp-witted feller – why, he had something funny to say afore every one of the acts. The first man up was Ed Ripley – he did the Cups and Balls, then he did it again, then he did it again – and it got funnier every time. Our German cousin Christian Schenk let a volunteer peek at a card in a shuffled deck, then Christian read his mind, quick as that. Then Harvey Berg was able to name the top 13 cards of a shuffled deck – pretty impressive! From the Italian branch of the family, Ricardo Negroni did real graceful coin magic. Francis Menotti (he ain't so Italian) scrambled his thoughts by shuffling a deck of cards, then got everything back in order. Chris Payne, one of the British cousins, showed us a colourful oil-and-water routine with Jokers. George Saterial found a signed card folded up in a paper-clip that was sittin' on the table the whole time. Francesco Addeo showed how a signature can jump from one card to another. Finally, Bruce Kalver shoved a big old knife right through someone's coat! Good thing he was able to patch it up or there might have been a ruckus. Just a few minutes later cousin Obie blew his durned whistle again to start another show. 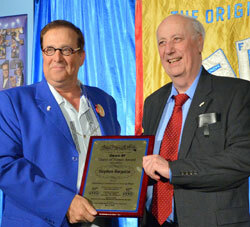 This time the Ceremonial Master was Gary "Mordecai" Morton, another one of our big-city cousins. He introduced Vinny Grosso who got his-self out of some handcuffs. Maybe we ought to send Uncle Elroy over to meet Vinny next time Elroy gets out on parole. Our Canadian cousin Chris Pilsworth magically put a spiky cactus right inside a blowed-up balloon. Then another one of our Japanese cousins came on stage: Yumi. She's a magician and a lady – I know we ain't heard of such a thing back in Groundhog Holler but it turns out that some of the best magicians is on the feminine side. Yumi showed us that if you forget about a knot, it just magically disappears. Next up was a cousin from Switzerland, Roland Meister, who had a card chosen and then it showed up on his official guv'mint ID card. Xavier Belmont did some incredible coin magic – you could almost see three coins flying between his hands, exceptin' they was invisible. Our fast-talkin' cousin Kirk Patrick showed off his new product Magi-Mist that makes miracles happen – then he ripped a phone-book in half – not just one page like we got, but a real thick big-city one. Then our Australian cousin Simon Coronel did some magic while speaking Chinese. I don't know what he was saying but he sure was funny while he was saying it. 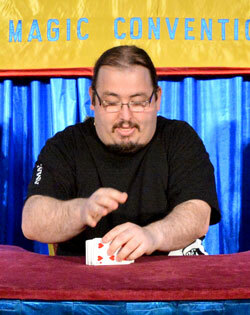 The last feller in the show was Rick Hebert – he magically turned Jokers into different cards. Later that evenin' we all got back together for a lecture from the Guest of Honor – you are gonna be real proud to know that this year it was our feller-Tennesseean Steve Bargatze! Steve told us all about how he got into being a magician and how he learned what it takes to be a successful comedy magician. He sure knows what he is talkin' about – he gave us a heap of super practical advice. He taught us some of his famousest routines, like his great routine with sponge balls, and the one with toilet plungers (pardon my language again) and the one he calls "Something for Nothing", and a bunch of others besides. Steve puts his heart into everything, and it's a great big heart. At the end of the lecture everyone stood up and clapped for a long time. Later that night I got invited up to "The Room" where a lot of people stayed up pretty much all night doing magic. 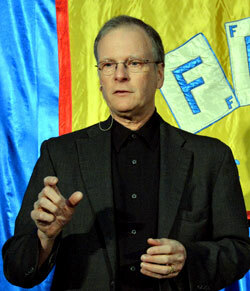 David Neighbors was there – that man can do things with coins that truly make my head spin. Will Houstoun and Tony Econ were doing miracles at the card table in the corner. The Room is run by Mike Hrab, Andy Quin, Matt Episcopo and Leon Etienne, and Ed Eckl is the resident genii. The next morning, Friday I guess it was, the first thing was a session called the Pat Page Memorial Workshop. The feller in charge was cousin Mike "McCoy" Powers, and he explained that this year it was all about coincidences. He led off the teachin' with a terrific card trick where three piles of cards all had cards on top that matched selections, and then the four Aces all showed up too. Then Tony Gerard did a routine called Destiny where two volunteers each chose the same card from different decks. After that, David Neighbors had a volunteer name a card, and it turned out that was the only card that was transposed between a red and a blue deck. Our Chicago cousin Dave Solomon had two cards selected from a shuffled deck – they matched two predictions perfectly. Then our very dapper cuz Gene Gordon taught us a murder-mystery routine using bits and pieces from the Clue game. Alan Zola Kronzek (maybe one of the Kentucky Kronzeks?) taught this absolutely fantastic routine about looking in the mirror – this was the best thing I learned at FFFF this year. Our crazy cousin Geoff Williams – if you invite him to the July 4 BBQ you better keep a big bucket of cold water close by – he taught us a great card trick where four matching cards show up at randomly chosen places in the deck. Finally, John Bannon bet a volunteer that the 7 of Diamonds would not show up when the volunteer turned parts of the deck face up until only one card was left. In the afternoon we got another lecture – I'm telling you Pa there ain't no end to the good teachin' at this place. This one was by one of our Spanish cousins, Dani DaOrtiz. Dani had helped out during cousin Woody's lecture yesterday so we already knowed he was good, but in his own lecture he knocked us clear over the haystack. He taught us a ton of pow'ful magic with cards, but the most important lessons were about what he called the sigh-college-ee of magic - that's a school in Spain I guess. Smart stuff like "Magic is about communication" and "Fool them with your attitude, not with your technique" and "Feel the same emotion you want the audience to feel." He was pitchin' ringers with every shoe, and he got a huge standing ovation when he finished. 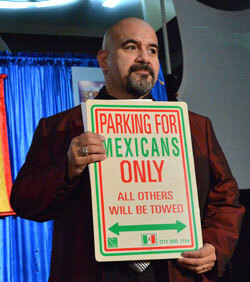 The next show was run by Oscar "Mose" Munoz, one of our Texican relatives. Oscar's kind of a scary-looking feller but once you get to know him he's more like your favourite cousin that you wish you could see more often. Oscar introduced Reuben Moreland, an amazing kid who did an incredible routine with cards and dice. Next up was Simon Lane – I reckon he must be one of Gran-pappy's cousins from England – he showed that when you count things odd, everything works out even in the end. Then Eric Jones made coins fly across from one volunteer's hand to another volunteer's hand. Our French cousin Remy Robert did a beautiful coin act without saying a word. Then one of the FFFF old-timers, Thomas Mosier, came back after 33 years and did magic with cups and balls – I guess he's been up-country for a while. Yuri Kaine, a cousin who hails from France, did card and coin magic – his hands were on fire – I mean he really set his hands on fire! I ain't never seen nothing like that before. Then we saw Yugi Yamamoto and Mariko Yamamoto – more of our Japanese family – he conjured with billiard balls and she made magic with silk scarves. After that Jeffery Carson stacked up two piles of blocks – when he mixed up one, the other matched. Tony Polli closed the show with some real visual coin and poker chip magic, all on a black and white theme. That evenin' they was another show, and this one was hosted by our cousin from New York City, Meir "Yankee" Yedid. The folks in his show were from all over the world – see Pa, we do got cousins everywhere. From the US of A, cousin Andost – he used coloured lights to magically change the colours of cards. From Sweden, Johan Stahl – he told a magical story about a boy and some coins. From Germany, Hayashi – he did something amazing called Matrix (even though he was doin' his trix in April). From Japan, Akira Fujii – he did his penetrating cigarettes routine, even more magical than before. From the USA, The Painters – Christian and Katalina used Uno cards for number mentalism. From France, Bruno Copin – he made cards flip over and spin around like they was possessed! From Taiwan, cousin Anson – he did a great classic manipulation act and got a standing ovation. From Germany, Denis Behr – he did three perfect predictions of the cards where a volunteer would stop dealing – he completely fooled me with this. From Canada, Michel Huot and Yannick Lacroix and Patrice Meunier – I cain't describe their act, but it was the funniest thing I ever seen in my whole life, even counting the time Old Man Riley tried to sneak outer the County Fair with six piglets hid inside his pants. Closin' out the show was cousin Zeki from South Korea - he made three signed chosen cards fly into an isolated envelope. Saturday was just like the other days – half the day was gone afore most of the guys even opened their eyes. I was out of bed at 4:30 of course – went over and fed the hosses at the Batavia race-track just out of habit. Funny thing, they's a steak-house restaurant right acrost the road from the track with a big statue of a hoss in front – I ain't sure what kinda steaks they serve! Anyways, the magic started with a lecture from Zeki, the South Korean cousin (I meant to axe him if he was named after Ma's brother Ezekiel). Zeki started with an awesome card trick where the cards ended up with different shaped holes cut through them, even though they was all solid at the start. He also taught us a great version of the Haunted Deck that you can do with a borrowed deck, any time. The best thing of all was his version of Jerry Andrus's Mylar Mystery – super clever technique and routining. After lunch we sat down for a show with Glenn "Beauregard" Brown calling the shots. Glenn's from Canada but he don't look it. Everybody's favourite uncle Karl Norman showed up – he was one of the regular magicians at the old Forks Hotel. As soon as he arrived everyone stood up and clapped for quite a while. 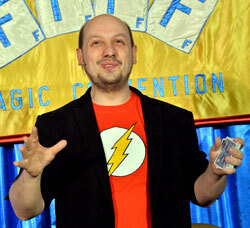 The show started with our Italian cousin Alain Iannone – he did card magic kinda like that James Bond feller. Then Clemens Ilgner showed the power of excellent routining by combining a series of strong effects into a great act. Vincent Hedan from France was next – he was able to draw a picture of a poem in a volunteer's mind. Hayafumi, one of our Japanese cousins, made a drink disappear when he poured it from one cup to another. Ines Fuentes, who is a lady magician from Spain, stapled together two cards with lipstick kisses on the outside, and then suddenly they was on the inside. After that, Sergio Starman did a real funny act with poker chips, sunglasses and shoes. Juan Luis Rubiales was next – he's from Spain – he made three cards change their faces all at once, without any cover! 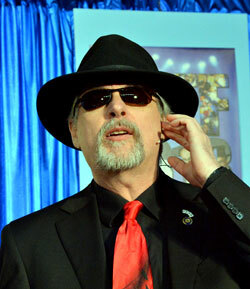 The last performer in Glenn's show was Michael "Six" Muldoon. He explained his nickname – I figured it was because his folks named all their kids the same (like you done), but that weren't the reason – and then he tore up money and used magic to put it back together. After a short break to water the corn, pardon my language, we had another show. 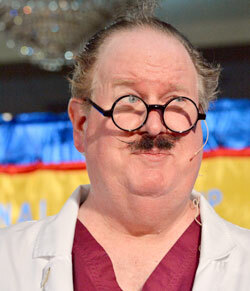 This one was run by a crazy brain doctor named Dr. Conundrum (who looked kinda like Dan "Dwayne" Garrett). 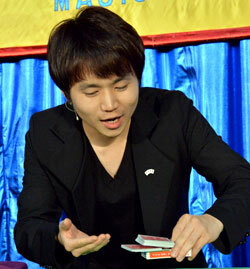 The first feller in the show was cousin Xiangyu Liu, who had six cards stuck on the outside of a cube – no matter how many times it was turned, he always knew which card was on top. 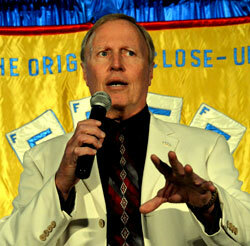 Then Darryl Rose did an "Apprentice" themed act, with a selected card predicted in today's newspaper. Our cousin Tristan Mory did some very skilled coin magic. Mark Davies told an emotional story about a mining disaster in Wales. Then Bill Bishop used cards and a poem to tell us about a contest between a gambler and a magician. After that our French cuz Thierry Biancarelli did some great coin magic using a little round box. Next feller to perform was Wesley Booth – he wrote down a prediction that exactly matched the card where a volunteer told him to stop dealing. Then Walter Rolfo had a card selected and the backs of all the other cards changed colour, and that ended the show. That night they was an "all-you-can-eat" dinner. I guess I kinda surprised them with how much country folk can eat. Good thing you and Ma wasn't there or they woulda needed to butcher more hogs. The last event of the whole shebang was the Grand Finale show, with Obie his-self as MC. First thing was, Obie got a big old standing ovation for organizin' FFFF for 43 years. Then a whole mess of people had gifts and nice words for Steve Bargatze. 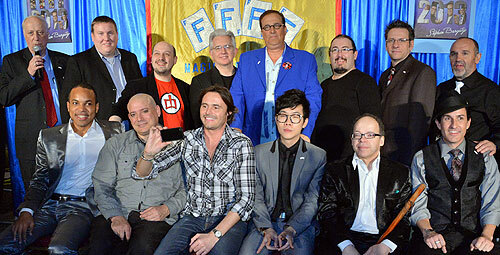 Matt Episcopo and Leon Ettiene showed a movie about some German feller who was real disappointed he couldn't be there. Leading off the performance part of the show was Michael Dardant – he had an anti-gravity ring – pretty danged amazing. Then our French cousin Bebel did some beautiful, understated card magic. After that Red Tsai did magic with cups and cubes, then produced a complete Mah Jongg wall! David Stone borrered somebody's finger ring and made it jump to the inside of a normal tennis ball! Turns out one of our cousins is a world-class balloon twister – that'd be Willy Monroe – he blew up a balloon and it came to life. Then our French cousin William Watt did some great card magic where random cards turned into Aces. Next up was Angel San Martin – he did cups and balls with changing colours, and he got a standing ovation. Our Canadian cousin Shawn Farquhar (next year's Guest of Honor) did this awesome routine where words appeared on blank cards, just at the same time as they was sung in a song. Dani DaOrtiz did this insane card routine where five volunteers all found their own cards after doing just about anything they wanted to mix up the cards – Dani got a standing ovation. Paul Gertner did the most terr'fying thing I ever seen, using four bags and a broken bottle. Woody Aragon had saved something real special to be the last magic act in the show – he mixed up a bunch of Jokers with different backs, then showed the backs were in any pattern the audience wanted, every time. 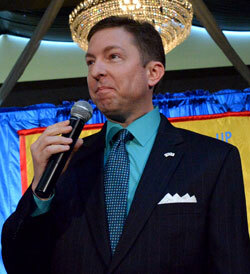 The very last performer of the show was Rick Merrill – he's a young feller with a whole lot of funny in him. He sure got everyone laughing with this poem he wrote about Steve Bargatze. After the show was over, Obie announced this year's Most Valuable Participant, for the choosin' of which we had all cast votes earlier – the 2013 FFFF MVP is Dani DaOrtiz. So that's all the news, Pa ... exceptin' this: I ain't gonna be comin' back to Groundhog Holler right away. I got invites to visit all these magical cousins I just met so I'm gonna take a trip around the world. I reckon it'll take a couple of weeks 'cause I'll be walking the whole way.